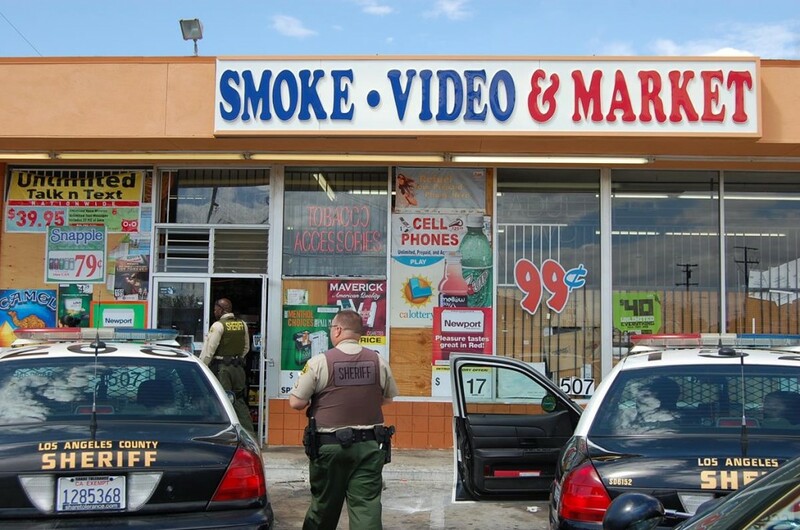 Complaints from the community regarding drug activity at the store prompted authorities to raid the Smoke Video & Market in Lancaster Thursday afternoon. LANCASTER – Baggies of loose Viagra and Vicodin pills, as well as bath salts and “spice” were just some of what deputies found when they raided a Lancaster convenience store Thursday afternoon. Owner Riad Dakhil was arrested and is accused of selling untaxed products brought in from Syria. The bust happened shortly after 12 p.m., when deputies served a search warrant at the Smoke Video & Market at 551 West Avenue J in Lancaster, according to Lancaster Community Relations deputy Michael Rust. 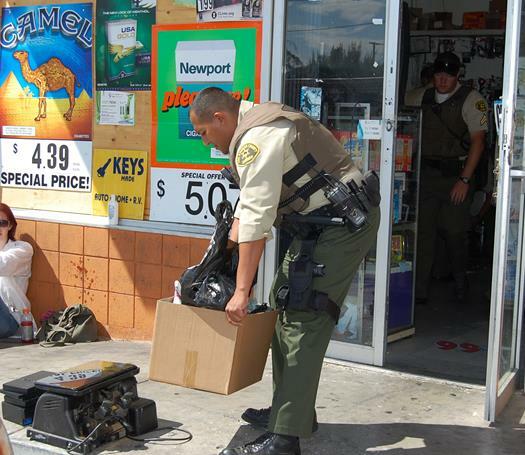 “It was an investigation headed up by our LANCAP unit regarding possible illegal narcotics activity taking place inside this particular store,” Rust said, adding that residents’ complaints are what prompted the investigation. During the search, deputies found a large amount of prescription drugs, synthetic drugs and drug paraphernalia, Rust said. “There were smoking devices for ingesting methamphetamines and scales and baggies, which is indicative of sales,” Rust said. Deputies also found a large amount of electronics that appeared to be stolen, including cells phones and gaming systems, Rust said. “The information is that they were buying or trading stolen electronics for goods out of there,” Rust said. 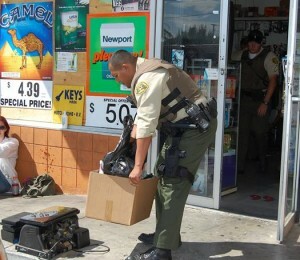 Several electronics believed to be stolen were seized from the store. Store owner, 54-year-old Riad Dakhil, was arrested at the scene for possession of narcotics for sale and a host of other charges. “So there’s a whole gamut of things that he’s doing wrong, but primarily, he’s selling illegal merchandise and narcotics out of this location,” Rust continued. Authorities were planning to serve a secondary search warrant at Dakhil’s home later that day, because they believed there were more narcotics at that location, Rust added. 29 comments for "Market shut down for illegal drug sales"
I actually worked for Riad at his shop up until the day that this happened. I’m in one of the photos above. With women, he was giving them money, spice, bath salts, meth and/or cigarettes in exchange for sexual favors. I don’t know if he actually was locked up or not…. but with all the crap that he put me and some other girls through…. I AM NOT SAYING I CONDONE THIS MANS ACTINS BECAUSE THIS [removed] IS EVERYWHERE. IF YOUR GOING TO COME DOWN ON HIM THEN CHECK ALL SMOKE SHOPS. THERE IS ALOT OF THINGS THAT GOING ON IN THESE SMOKE SHOPS!!! LOL..
Dude..if they take away the Smoke and Video stores where will I rent my videos since Blockbuster is gone. And those pretty colorful water pipes they have in the glass display, those are a work of art. We need more art here in the AV to save power for all the solar energy we are generating man. The World is going “Green” and its time The AV wakes up and starts saving your recycled copper and cans. What they should really hit is the donut shop across the street, and the other donut shop on I. Pretty sure those places have been selling drugs after hours for years. There is a reason they lost the Winchell’s franchise rights. Hope the place is permanently shut down and they lock these vermin up and throw away the key. I drove by there today, and it looked open. The city says they are revoking his business license. Oh and meanwhile murderers or rapists run rampant violating innocent people. I really do not care about the Smoke Shops as they eventually get caught. I am concerned about the large presence of gangsters in our area (all of A.V.) I strongly believe Rex made a mistake targeting only one particular gang because there are so many more out here. Kind of reminds me of driving by “The Jungle” aka projects in L.A.
Get a clue nadia. This guy.is a drug dealer. WE ALL KNOW SMOKE SHOPS ARE JUST COVER UPS!!! ITS WHAT GOES INSIDE!!!!! AV ALWAYS BE HAVING LOTS OF DRAMA! We own Smoke shops, and we run a legit business. Just because one of these morons doesn’t know how to run a shop it doesn’t mean we are all like that. Thank you for backing us legit smoke shops!!!!!! WE THE PEOPLE need to unite and not be afraid to take on these criminals and have the backs of our law enforcement. People are too chicken #%! @ to get involved but complain about stuff being messed up. ONE DOWN! 99 MORE TO GO!!!! AND THATS JUST IN LANCASTER! NOT COUNTING PALMDALE, LITTLE ROCK AND LAKE LA! I am working on improved language to address these “bath salts”. Current law has big loopholes, and i attended a presentation by an expert that is forwarding me reference material to include in a local ordinance. All smoke shops sell drug paraphernalia! LANCAP- go raid all of them. Agree with you comment about all smoke shops and drug paraphernalia. I can’s understand why TRex and Jimbo don’t pass city ordinances to ban the sale of glass pipes and bongs in these places. It’s not the device, it’s how it’s used… Guns don’t kill people, pipes don’t get people high. Same logic. Check out this movie and it may just change your opinion of glass pipes. Flat out amazing pieces of art and it has actually revived the all but dead art of hand glass making.. The format of our current laws in relation to prohibiting the possession of tools that may be used for felonious reasons is beyond out of hand. It removes the responsibility of the action from the human to an inanimate object and another example of society’s refusal to take direct responsibility for human actions. Someone with a respectable collection of real high quality glass pipes should enter them into the 2013 Antelope Valley Fair. It would be fun to see the public reaction to non-conventional art..